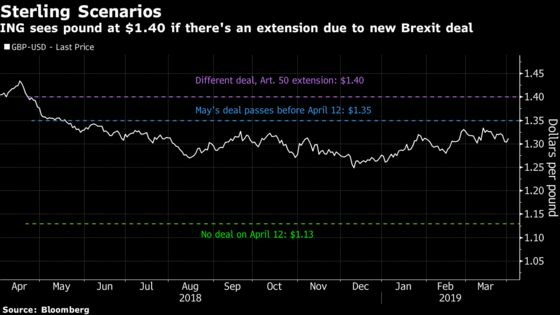 The pound will see a short-lived boost if U.K. lawmakers signal support for a soft Brexit Monday, according to analysts. Members of Parliament will hold indicative votes on various alternatives to Prime Minister Theresa May’s thrice-defeated withdrawal agreement Monday, with strategists seeing the motion calling for a permanent customs union with the European Union as the most likely to garner a majority. Nomura International predicts sterling could gain should that option pass, but said the move might be limited as the results aren’t binding on the government. Sterling rose 0.6 percent to $1.3110 as of 1:48 p.m. London time, while it appreciated 0.4 percent to 85.70 pence per euro.